An injured Kilgrave makes his escape from the facility by ordering Jeri to drive him away. Jeri is horrified at realising the truth about how depraved Kilgrave is, having witnessed him command his mother to kill herself. Kilgrave orders her to drive him to a doctor. Jessica goes back into the building and finds Trish hysterical and repeatedly tapping a bullet against her head because Kilgrave had commanded her to put a bullet in her head. Jessica forces Trish to put a bullet into her mouth so that she will have fulfilled the command without dying. Jessica then has to restrain Albert who wakes from his unconscious state and resumes trying to cut his heart out. Detective Clemons is calm but shaken from the experience, also having a badly injured hand from forcing it out the handcuff under Kilgrave's order. Jessica informs Trish and a taped-up Albert how she is now immune to Kilgrave and Albert shares how Louise had been working to find a vaccine against Kilgrave's ability, which works like a virus. He can't work right away on trying to develop that vaccine himself because of Kilgrave's order but Trish can do it for him under his instruction. Jessica gives them a sample of her blood to use and test in Albert's motel room where he has some equipment. Jeri brings Kilgrave to Wendy under the hopes that he'll command Wendy to sign the divorce papers. Jeri admits to Kilgrave that Hope had been pregnant with his baby but aborted it, after which she kept the remains for herself to try to recreate his abilities but it didn't work. Jessica didn't know about this but calls Jeri after Kilgrave has finished being patched up by Wendy. Kilgrave commands Jeri to answer and act normal, to not reveal that he is there, and to find out where his father is. Jessica appears to be suspicious of the call and pretends not to know where Albert is. Jessica overhears Wendy on the call before it ends and Kilgrave deduces that Jessica does know where Albert is. Wendy, having previously made a comment about 'death by a thousand cuts', is commanded by Kilgrave to get her revenge on Jeri by doing that in the very literal sense. Will arrives at the facility where Clemons is guarding the evidence of the scene that will be used to help put Kilgrave away. Will asks Clemons what happened, identifying himself as special forces. After Clemons catches him up on the recent events, Will shoots him dead execution-style as he doesn't want Kilgrave to go through the courts but simply be killed. After killing Clemons, Will destroys the evidence by setting it all on fire. Will is high on the effects of the red pills that Kozlov gave him, which were designed to enhance combat performance and act as an extreme pain-killer. Pam arrives at Wendy's house and knocks Wendy in the head with a decorative piece of furniture to stop her attack on Jeri. Jeri falls into the corner of a table and is killed as a result. Pam is shaken, not having intended to kill Wendy, and Jessica arrives immediately after. Jessica angrily exposes Jeri for trying to use Kilgrave for her own selfish purposes, to the detriment of others, saying she was the one that sabotaged the kill switch to allow Kilgrave's escape so he could try to help her with her divorce and as a result Louise died. Jessica assures Pam that what her killing Wendy was just an accident but what Jeri did was murder, then leaves. Trish is still working with Albert to try to develop a vaccine against Kilgrave's abilities using Jessica's blood. Malcolm is trying to help Robyn in her futile search for Ruben, out of guilt for what happened to him. Jessica returns to her apartment and finds Kilgrave waiting for her, admitting that he's know she was immune to his abilities for some time now despite Jessica only having just figured it out. Kilgrave reveals that he has used his abilities to get Hope 'legally' release from prison and is offering to give her back to Jessica in exchange for his father. Pam is brought in for Wendy's death and Jeri tries to represent her but Pam refuses the offer, ending their relationship for all that Jeri has done. Jessica and Kilgrave recall a particular moment in their 'relationship' that they have disagreeing accounts of. Kligrave deliberately let the time span of 12 hours run out since his last command on her in order to test if she genuinely wanted to stay. Jessica recalls that Kilgrave had gone inside while she was on the balcony. She then got on the edge of the balcony and considered jumping off the edge to commit suicide. But while she stood there debating her option, Kilgrave commanded her back off the ledge. Kilgrave believes that the encounter proved that by her not jumping, she proved that she still wanted to be with him. But Jessica reminds him that he got angry and told Jessica to cut her ears off but stopped her before she could go through with it. However, Jessica still has a scar behind one of her ears from the encounter. Jessica then knocks Kilgrave out. Malcolm admits his role in covering up Ruben's death to the support group, not realizing that Robyn has followed him and overhears the entire confession. Robyn stores up negative sentiment among the group towards Jessica and rallies them into taking action against her and Kilgrave. The group arrives at Jessica's apartment and attacks her. Robyn briefly disarms Jessica by knocking her in the head with a plank of wood and then goes to free Kilgrave, not knowing nor understanding the danger of releasing him. Will arrives at the motel where Trish is with Albert. She is taken aback by how he is high and the oddness of his behaviour and he admits to taking pills, claiming they're helping him to recover from his accident. Will flies into a rage when he learns that Albert is Kilgrave's father and when Trish is knocked into a wall during the commotion, she angrily kicks him out of the motel room. She then notices that she has managed to get a bottle of his red pills. Jessica wakes and gets a call from Hope who is about to be released. Jessica hurries to get to the prison but when she arrives, she finds that Kilgrave has already taken her. They are waiting for her at his favourite restaurant. Albert is able to work on the vaccine research now that the 12-hour period has passed. He gives Trish information on what the red pills Will was taking probably are. They're the type to help with strength but they have dangerous side effects because your conscious won't grow to adapt to your new strength. Jessica brings Albert to the restaurant where Kilgrave is sitting with Hope while all the support group members are standing on the bar with nooses around their neck that will strangle them if they jump off the edge of it. Hope pleads with Jessica to kill Kilgrave but Jessica doesn't want to make a move towards him that would risk any innocent deaths. Kilgrave summons Albert to him and Hope breaks a bottle to get a piece of glass to stab herself in the neck to die to keep Jessica from focusing on her and simply go after Kilgrave and kill him. In her dying breaths, she pleads with Jessica to promise to kill him which Jessica does. Kilgrave gets away with Albert because he commanded the support group members to step forward, forcing Jessica to stay and dislodge the pipe from the ceiling that the ropes were tied to. 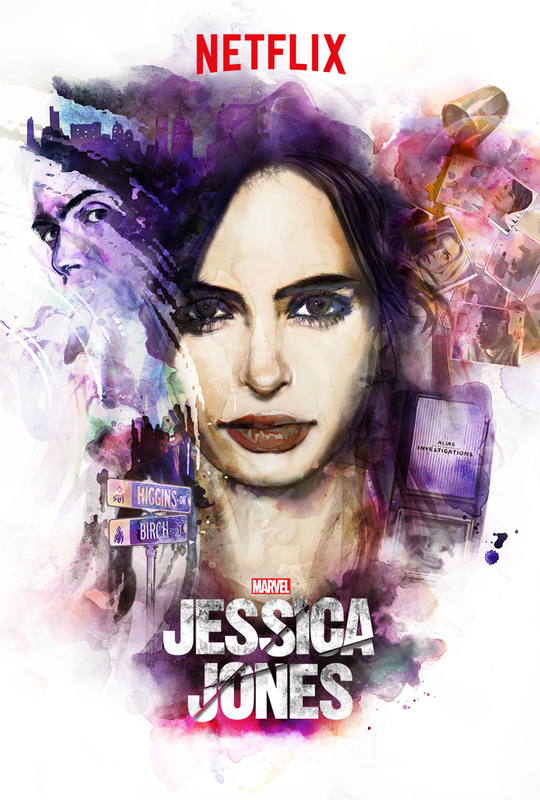 Marvel's Jessica Jones is available on streaming for Netflix.